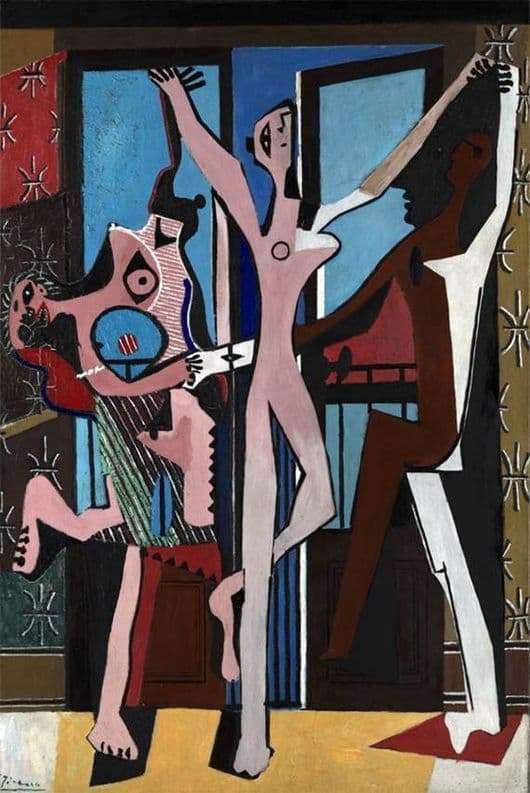 “Dance”, written by Pablo Picasso in 1925, is differently called “Three Dancers” (sometimes “Three Dancers”) and is considered a painting, the date of writing of which is the date of the beginning of the period of surrealism in the artist’s work. What caused such a negative emotional and expressive coloring of the picture, and why was such a plot chosen? One of the reasons for the heavy mood in the picture is called the difficulties in the relationship of Pablo with his wife, Olga Khokhlova, who were going to break. Hence the plot: the ballet circle was very close to the woman, and in an attempt to portray it, according to art critics, Picasso could not resist his mood and emotions. Another reason for the depiction of the three dancing figures was the love triangle witnessed by the artist. His friend, embroiled in this relationship, shot himself because of his beloved, who then became the wife of another, whom she had always loved. However, the latter died just in 1925, while painting. As already mentioned, this is the first work of the artist in the genre of surrealism. In it, the author examines the bodies of dancers and dancers, making up of them then new ones, which shimmer in bizarre forms and figures, creating a multitude of shadows and images. Those characters express emotions, which are quite difficult to recognize because of their symbolic image. All these dances take place in a room with a yellow floor and black and brown doors open. It was widely believed that family problems caused portrayals of people holding hands, like weird, disfigured toys, such as puppets on strings. But only in the year 65, Picasso gave an explanation that the canvas depicts the “Dance of Death”, associated with the death of two good friends of the artist because of a girl who did not bring happiness in marriage to either one or the other.